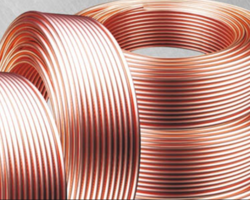 Pioneers in the industry, we offer level wound coil (lwc) copper tubes, copper pancake coils, copper tubes and copper fittings from India. Other Details:- Oxygen free copper, suitable for the industrial air conditioning system & refrigerant (gas) R410A, R32 with high working pressure. material for the manufacture of tube bends, electrical water heaters, heat exchangers, solar collectors, and cable lugs. long lengths and the resulting coil weights of up to 300kg provide the consumer with several advantages little scrap, optimization of machine times and higher manufacturing flexibility. As the tubes comprise deoxidized copper, it is not affected through reducing atmosphere and is well suited for welding and brazing applications such as air conditioner and refrigerator water tube service and distribution, liquefied petroleum (LP) gas HVAC etc. 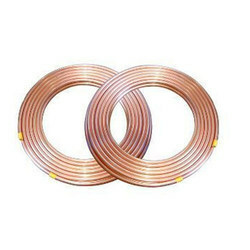 Good Electricity and Heat Conduction, Good Elongation, Extruded and Processed Well, High Quality Copper Pancake Coil. Copper pancake coils provide superior reliability and improved durability for effective long-life functioning. The Provided coil used for air conditioner, brake tubing and many more in various industries like construction works of engineering, industrial, commercial and residential installations. Designed to provide faultless performance for long service periods, these Copper Pancake Coils come in different dimensions and can also be customized as demanded by the customers. Made Using High-Quality Raw Materials, One Piece Extruded Tubes, High Quality Copper Pipes & Tubes. Copper Pipes & Tubes manufactured at our facility comprises minimum copper content of 99.9% as per IS-191. 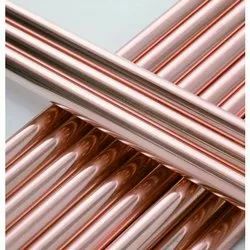 Being resistant to corrosion, these precisions finished copper pipes and tubes feature superior mechanical strength and provide for low-pressure loss. These pipes and tubes also feature superior bactericidal properties and satisfactory flow performances that are achieved with smaller diameter tubes. It can be used to make smaller, lighter and stronger copper radiators. These copper radiators will be far more environmentally friendly because they are lead-free and easier and cleaner to produce. Scaling and corrosion resistant, Superior Antibacterial Properties, Suitable for Drinking Water, Air Conditioning and Refrigeration Applications. 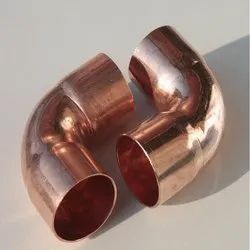 We offer a wide variety of copper alloy fittings that are put to different use in domestic and commercial applications ranging from air conditioning, refrigeration, heating, fluid distribution, air pressure lines and plumbing etc. Our fittings boast of smooth surface and impeccable finish. Copper pressure fittings for use in residential and commercial systems such as potable water and fire sprinkler applications.